I started with the best breakfast of this trip today at the Spean Bridge Lodge B&B, beautifully served by Glen. Moreover, having pretty well finished Day 12s blog last night, I had time to actually eat it, rather than just cram. The only problem was I had left Marion to order for me last night (whilst I went to the bar). So it was fruit, porridge, and a full Scottish breakfast. It was something else. Today we were riding for Camilla Hildyard, whose Mother Isabella is a former Member of our University Council and someone I know. Svenja was the designated rider, and this is what she had to say: ‘I feel humbled and privileged to be riding in honour of Camilla. She actually passed away some years ago, and I am struck by the fact that there has been so little change in research funding since then. Brain tumours are the biggest cause of cancer deaths in children. I am inspired by the courage and perseverance that Cammy’s family have brought to bear in both raising funding for, and awareness of, brain tumours’. Chris J, Karen, Marion, Nieves, Svenja and Susan were, as always, away at 07:30; then Doug, Andy, David W and Steve. Nick waited for me and we left shortly after, followed by Chris R, Penelope and Esteban. 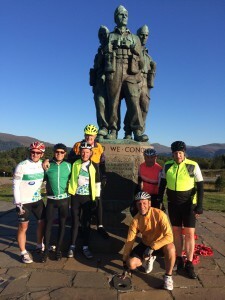 There were clear blue skies in Spean Bridge, although it was cold. I did debate whether to put on leg warmers and heavy gloves, and fortunately did so. Quite soon we were in the shadows of the peaks, facing an icy easterly wind; and August or not, I do mean icy. Then we were in heavy cold mist. That lasted all the way across to Fort Augustus. It was not nice. By the time we got there, fingers and toes were frozen. Over that first 20 miles or so, we ran into each other several times, as different groups stopped at the Commando Memorial which looks on to Ben Nevis, then to take pictures of a spectacular bank of mist rolling down Loch Lochy. Pretty well everyone was together for a break in a café by the Caledonian Canal in Fort Augustus. After that, things starting breaking up as different groups opted for different routes. Chris R and Penelope, and Doug, David W and Steve went south of Loch Ness over the old military road. This evidently rises to 1,200 feet and they confirmed afterwards that the spectacular vistas promised were realised. Three other groups (Chris J, Karen, Marion and Nieves; Susan, Svenja and Esteban; and Nick, Andy and me) all opted for the A82 all the way to Inverness. The first two groups stopped at Drumnadrochit for lunch and to meet friends of Nieves; my group pressed on and had lunch by the river in Inverness. The A82 was busy, but we made rapid progress and were there around 13:30. We had ridden out the miles at a good pace and decided we would try and fit in a small treat – a visit to the Dalmore distillery in Allness. That meant heading up the A9 and over the Cromarty Firth, straight into a driving north easterly head wind. It was hard going. By the time we got there we had missed the last tour, but Andy (who was first in) persuaded the staff to give us a private tour, led by Shelley. The distillery enjoys a commanding position on the shore of the Firth, and has been producing single malt since the 1880s. It was a very informative tour. Andy bought me a bottle of ‘The Distillery Exclusive’ for my collection, which was wonderfully generous. (To de-risk the possibility of this being opened when we celebrate at the end, I also bought a bottle of their 15 year old to share!). This little sojourn was the first (and no doubt only) bit of ‘tourism’ on the trip, and a great bit of respite. It lifted the spirits. Our injury list continues to grow. Svenja and Susan are still nursing their respective muscle strains; Esteban’s shoulder seized up; and there are hand, knee and thigh problems for Marion, Chris J and Karen. But things are getting patched up, and bedtimes getting earlier. One of the things that always surprises me is the regularity with which other parts of the group just seem to pop up. David W is renowned for it, he disappears and then unexpectedly reappears somewhere else. (Those who ride most often with him claim these absences are nap breaks). But it also happens with groups. Having separated from the other two groups on the A82 before Drumnadrochit, as Nick, Andy and I came to our first island to leave Inverness, the other groups were disappearing from the other side. And, having taken different routes through the city, we saw them again on the bridge over the Firth! It also happened with our leg rider for the next three days, Bob Bayman (former President of the SU and former University Council Member) when Chris R ran into him three miles outside of Strathpeffer. Bob joined us for dinner, as did David R.
First, Svenja has lost one of her purple fingernails. The search is on for a nail bar in Ullapool (which hopefully will do Life Cycle 4 colours). Second, in lobbing clothing over the shower doors into the sink tonight, I missed twice (one shirt and one sock). I obviously am tired! First, Karen to Helen, ‘Thanks for the drugs and strappings’. No comment. Second, at the bar, Paul said to the assistant ‘This is the gentleman in room one’; the assistant replied, ‘Your shower must be leaking; we have had an overflow down here’. I confessed to allowing the water to build to up in the tray so I could tread wash my cycling clothes. ‘Why did you that, I would have washed them for you!’ Too late sadly. We continue to be overwhelmed by spontaneous generosity. Pretty well everywhere we stop people ask us what we are doing and why, then invariably make a contribution. 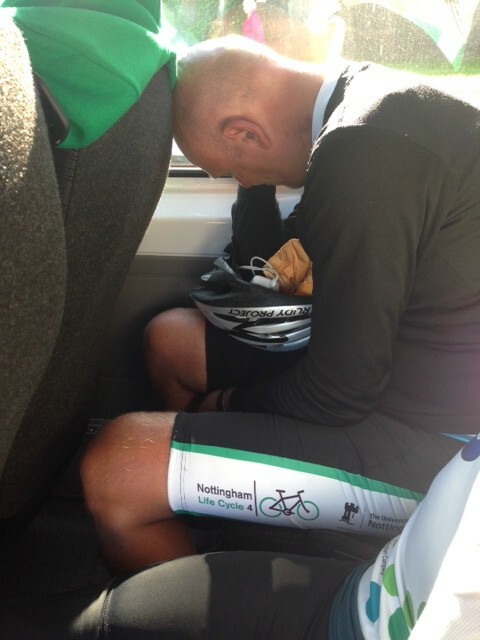 Finally, I am overwhelmed by images of riders sleeping all over the place; Andy wins today. I am also receiving an increasing number of entries for the Life Cycle calendar, and Paul is the pick for today. We passed another milestone today; we have all ridden more than Life Cycle 3. So we are all in new territory. A further 80 miles today takes us to 1,175 miles in total. Having had an amazing run of weather, it is finally due to break tomorrow. So heavy duty wet weather gear for the run to Inchnadamph. Thinking about Svenja and her weather data points, would it be extrapolating too far to ask if the decline in lobbing accuracy was somehow correlated with the distillery visit? All the best to everyone on the last “few” miles. Well the moment has come, I’ve watched the videos, read the blog and just need to say I feel a little overwhelmed by you all, your journey, your families and supporters, but most of all your drive, determination an, capacity for cream-teas and Sudacrem that you all display. I hope the last few hundred miles are king and that you continue to be part of the winning team in the Challenges. Remind me to get Marion to order a breakfast for me sometime! That sounds weird Marion, but what the VC describes is simply scrumptious! Well done everyone on surpassing the Life Cycle 3 mileage and on continuing the daily grind in spite of ever deepening weariness, aches and pains. Good luck as you ride into the Inchnadamph horizon.. and the new territory this brings. Quite amazing that you are keeping this blog going David and that it seems to get longer rather than shorter each day. We are all loving reading it and incredibly grateful to you for writing it. Here in Ningbo we are beset by the biggest electrical storms I have ever seen in my life so just be glad you are in Scotland where of course it never rains …. Good luck for the final stages everyone! Glad to hear that the distillery tour both picked up your spirits and allowed you to pick up some spirits too! (The photo looks like it’s not far from “Kilfinnan” – such beautiful country, which I unfortunately can’t lay claim to, although I have stayed there). Not long now!! So all the same new territory from now on, for experienced Lifecyclers and newbies alike. I know that after piling that wet weather gear on, you’ll all grit your teeth, give it your all and grind out the miles to Inchnadamph for your fantastic cause. Sorry to hear about all the injuries although, I suspect, that they all seem insignificant in the context of a lost finger nail. I hope that this does not derail the entire endeavor? Svenja: Just throw the rest away, and book an appointment when you get back. Hopefully, the weather won’t break too much tomorrow. Good luck. 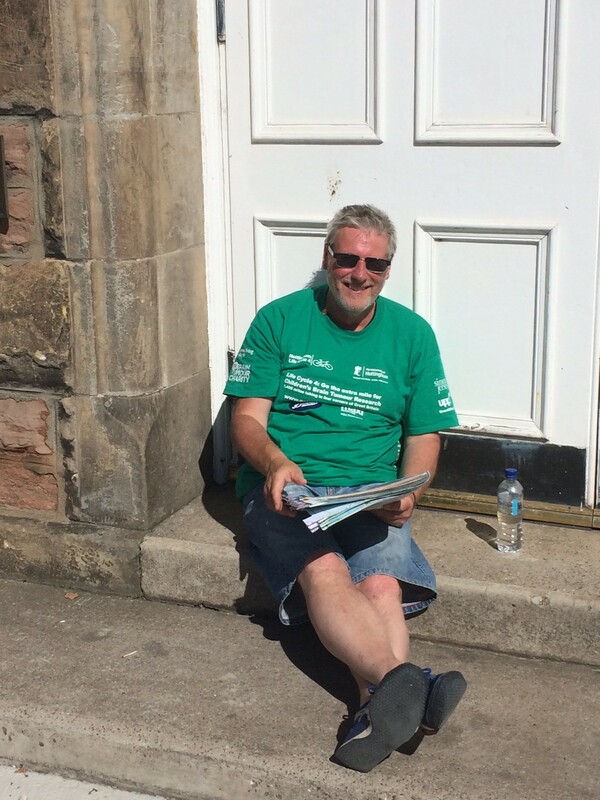 Wishing you all a safe final leg of your long ride, sorry to hear about the forecast! Having known David W for nearly 30 years, I sympathise with you all. I have probably spent 5 years of which just watching him nap or looking for him, he has this habit of disappearing!! Anyway glad to hear the injuries are settling, that spirits are high (in more ways than one) and that the mamouth undertaking is nearly complete. Not long now. I hope the final leg goes well tomorrow, the weather holds and the injuries are kept at bay. It is once again a fantastic achievement. Unfortunately I won’t be at uni park to cheer you in on Sunday, but will be thinking about you and giving you a cheer as I fly back. Ride safe, chapeau to all. 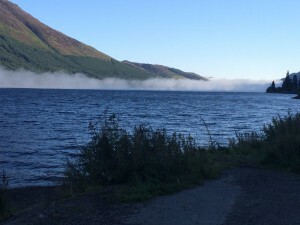 From what I can recall from my recent boat trip on Loch Ness, the reason mist sits on the surface of the Loch on chilly days is due to its immense depth of over 750ft. Apparently, the water below 100ft remains at a constant temperature, so there is a constant exchange of warm and cold air causing condensation. Something like that, anyway. 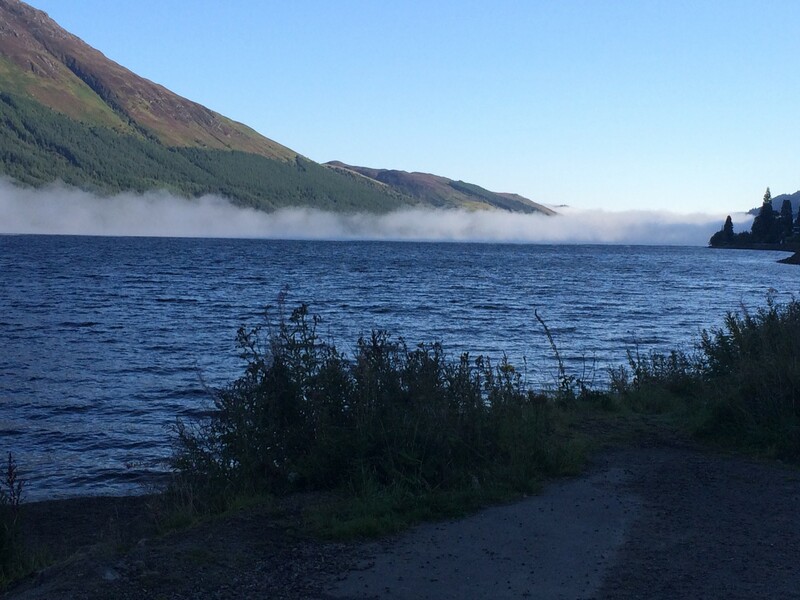 I was too busy Nessie spotting to pay close attention. Not far now! Keep going!